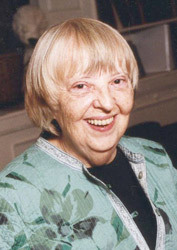 Mary-Ella Holst of New York City is an active Unitarian Universalist leader. She serves many organizations with her passion for teaching, history, and fundraising, including her home congregation of All Souls in New York, the UUA, the UUSC, the UU Women's Federation, and the Murray Grove Retreat and Conference Center. Teaching religious education classes for years and then going on to serve as the Director of Religious Education until her retirement, Mary-Ella recently celebrated 50 years of membership at the Unitarian Church of All Souls. She currently serves All Souls as President of the Historical Society. Over the years, Mary-Ella has given several generous life-income gifts for the benefit of the Unitarian Universalist Association and many of the other UU organizations she loves. "I chose to leave legacy gifts for both emotional and practical reasons," says Mary-Ella. "My giving reflects my focus within Unitarian Universalism; a focus on women, social justice, history, and my own community." Giving through the UUA's charitable gift annuity program is the practical side of the equation, Mary-Ella states. "I receive a much appreciated, generous, and guaranteed payment every three months, plus there were significant tax benefits!" Mary-Ella's respect for our religious heritage has inspired much of her work and generosity. Her commitment to this heritage is extended through her legacy giving and belief in the promise of Unitarian Universalism. Mary-Ella says with a smile, "I trust the future." Contact the Legacy Gifts Team at (617) 948-6509 or legacy@uua.org to learn how you can leave a legacy gift with a charitable gift annuity like Mary-Ella.